Member's Mark Infant offers complete nutrition for babies 0-12 months. Neuro Complete contains key ingredients that are on the minds of healthcare professionals that address cognitive, motor, communications, and social function. Member's Mark Infant is clinically proven to be as well tolerated as Enfamil®. * We encourage you to compare Sam's Club's Member's Mark Infant milk-based powder infant formula with iron to the nutrition of the nationally advertised brand, Enfamil® Infant. Member's Mark Infant is inspired by mother's milk. It features DHA, a fatty acid for brain and eye development that is found naturally in breast milk. It also contains choline, which occurs naturally in mother's milk and supports brain and eye development. Inspired by breast milk, Member's Mark Infant contains prebiotics for immune support and digestive health, as well as antioxidant vitamins and minerals, including Vitamin A, C, E, and Zinc for immune support. We take measures to eliminate genetically engineered material in our ingredients, but trace amounts might be present in our products. 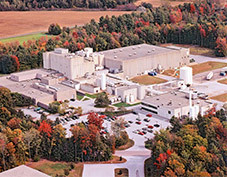 We disclose that trace levels may be present in finished product from process sources and manufacturing environments. Additionally, some methods used to obtain ingredients (such as fermentation) may involve genetically modified microorganisms or genetically engineered substrate. Animal feed is often genetically engineered. This may mean some dairy ingredients used in the manufacture of non-GMO infant formulas may originate from cows fed some feed containing genetically engineered ingredients. This is common among many dairy-based non-GMO foods on the market today. Learn more about what non-GMO means to us at babyformula.com/non-gmo. We make the most important products for the most important people. That's why our team conducts more than 20,000 tests per month to make certain Member's Mark Formulas meet our standards before they meet your standards. NONFAT MILK, LACTOSE, VEGETABLE OILS (PALM OLEIN, COCONUT, SOY, HIGH OLEIC [SAFFLOWER OR SUNFLOWER] OIL), WHEY PROTEIN CONCENTRATE, GALACTOOLIGOSACCHARIDES‡, LESS THAN 1%: MORTIERELLA ALPINA OIL*, CRYPTHECODINIUM COHNII OIL**, FRUCTOOLIGOSACCHARIDES‡, SOY LECITHIN, VITAMIN A PALMITATE, VITAMIN D3, VITAMIN E ACETATE, VITAMIN K1, THIAMINE HYDROCHLORIDE, RIBOFLAVIN, VITAMIN B6 HYDROCHLORIDE, VITAMIN B12, NIACINAMIDE, FOLIC ACID, CALCIUM PANTOTHENATE, BIOTIN, ASCORBIC ACID, CHOLINE BITARTRATE, INOSITOL, CALCIUM CARBONATE, CALCIUM CHLORIDE, CALCIUM HYDROXIDE, MAGNESIUM CHLORIDE, FERROUS SULFATE, ZINC SULFATE, MANGANESE SULFATE, CUPRIC SULFATE, POTASSIUM BICARBONATE, POTASSIUM IODIDE, POTASSIUM HYDROXIDE, POTASSIUM PHOSPHATE, SODIUM SELENITE, SODIUM CITRATE, TAURINE, L-CARNITINE, BETA-CAROTENE, MIXED TOCOPHEROL CONCENTRATE, ASCORBYL PALMITATE, MONOGLYCERIDES, NUCLEOTIDES (ADENOSINE-5'-MONOPHOSPHATE, CYTIDINE-5'-MONOPHOSPHATE, DISODIUM GUANOSINE-5'-MONOPHOSPHATE, DISODIUM URIDINE-5'-MONOPHOSPHATE). ***Enfamil Premium® is a registered trademark of Mead Johnson & Co. 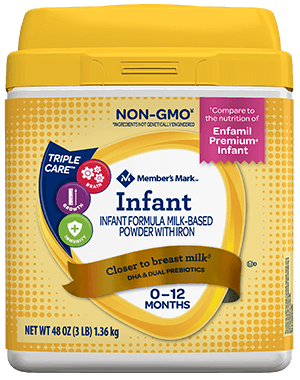 Member's Mark Infant Formula is not made by or affiliated with Mead Johnson & Co.
****Comparison based on June 2018 price survey of Member's Mark Infant Formula vs. Enfamil Premium® Infant Formula. Actual prices may vary by store location and product. *****Studied before the addition of prebiotics.